Kirk Kelso is a product of West Texas, growing up in Menard in the 70's and graduating as the valedictorian of Bronte High School in 1982. He was active in football, basketball, track, band, one-act play, National Honor Society, Spanish club, yearbook staff (we had to fill in the gaps!). Kirk attended the University of Texas in Austin living in the Jester West dormitory from 1982-85 and graduated from Angelo State University in August 1988 with a Bachelor of Arts in Marketing. Yes, that was six years of intense, well-rounded undergraduate work! Upon his return to Austin the day after his graduation, Kirk commenced to seek out employment and further studies including, but not limited to: The Gap, Texas Medical Association, UT majoring in Spanish, patient care technician/bipolar support group facilitator (Charter Hospital), go-go dancer (Lizard Lounge), flood plain researcher (Flood Data Services). On January 1, 1996, he was hired by BodyBusiness as a group exercise instructor and in August of that same year he added "Personal Trainer" to his repertoire. 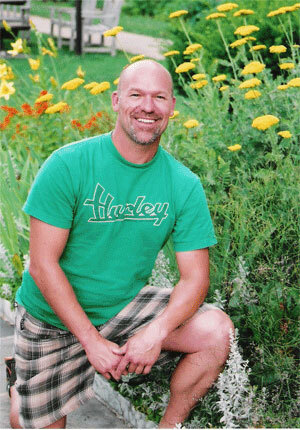 Kirk began his yoga studies with Castle Hill's inaugural Yoga Instructor Training Program in October 2006 and completed his training in May 2007. Kirkwerks was established April 1, 2008. Kirk loves his home, his business, photography, volleyball, his three dogs: Pima, Pie, and Foxtrot; and he fully intends to keep Austin weird. 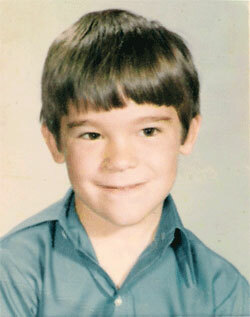 As a child I was a somewhat shy, very cautious and a little precocious. I was quite smart, learning to read and write cursive before entering first grade. I was perceptive and very sensitive. I had a vivid imagination and I drew for hours with my pencil and my Big Chief tablet...pictures of cows and Noah's ark and girls with their long hair blowing in the wind. I loved being in the backyard away from the house swinging in my swing set and singing when no one was listening. I loved the grand and the sparkly and all things girly and I had no idea that anything was wrong with any of it. So, I dumbed down my intellect and I devalued my intuition. I did all that I could to harden myself and I learned how to "win" by being competitive and "beating" people at games and races by exploiting their weaknesses. I stopped drawing and I stopped singing and all of my grandest dreams and sparkly imaginings went way, way down deep inside. I devoted hours to sports in which I had little talent and even less desire to play. I spent years studying subjects that bored me to tears all to support the facade of achieving an upwardly mobile career and making lots of money. My stomach stuck out and my nose was too big; I hated my voice. I always felt that I should have been a better athlete. I thought that I should have been more successful in college. If I was only more disciplined and strict with myself...I thought. But I could not do it. I could not be a success where my heart was not. I only succeeded in being hard on myself, intolerant of others in the same boat, and jealous of those who appeared to have success. And I closed the door on the light inside of me. Diamonds in a vault don't sparkle. Initially I got into group exercise and personal fitness because I love people. I loved the idea of helping people live happy, healthy esteemed lives; reaching further than they believed that they could or even dared, yet finding peace with where they happened to be at the moment. Ten years later I got into yoga because I loved myself. And it was time...It was time to live a happy, healthy, esteemed life. It was time to reach further than I believed that I could or even dared. It was time to find a peace with who I am and where I am at the moment. And, I've come to a conclusion: I'm a hottie! I just am!